Making your own server for the game, Well of Souls. Running your server without actually playing the game. Setting the RULES which apply to your server. You might find it easier if you print these instructions and then follow them. What I actually tell you how to do is quite simple, but I use up a lot of words along the way. WHERE DO I GET A COPY OF MIX? When you downloaded and installed your copy of Well of Souls, you got the lastest and greatest version of MIX along with it. (More accurately, the latest and greatest version compatible wit WoS, so it's the version to use). You do NOT need to download the version from the MIX home page, since.. well, you just don't need it, OK? UM, I LOOKED AND LOOKED, BUT I CAN'T FIND IT! Of course, this assumes you installed WoS to it's default installation location. Otherwise, replace the first bit of that with the proper folder for your PC. If you have just gone through the effort of finding "mix.exe" why don't you make a shortcut to it right now (right click on MIX.EXE then *drag* it to your desktop, and select "make shortcut to" from the little menu). We'll be using this shortcut later to do some cool stuff. OK, I FOUND IT, NOW WHAT? Did you make the shortcut like I asked you to? I'll wait.... OK, here we go. First of all, you dont NEED that shortcut. (ha ha!) But it will come in useful later (after we mess with it a little) if you want to make a semi-permanent WoS server to be your own little domain in the WoS universe. 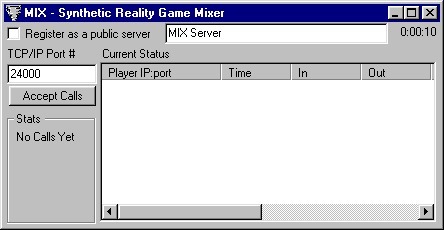 Select "Any Public MIX Server" from the MULTIPLAYER menu. If you don't see a server you like on the list, click the CREATE NEW SERVER button. Read the instructions, but basically you need to give it a name. It will remember this name the next time you start it up as well. This will result in a new public MIX server appearing the WoS list of available public servers. Even after you stop playing WoS, your server will still exist until you shut it down (or turn off your computer). You'll know it is still running because you'll see a button for it on your task bar, just like any other program you run on your computer. SO, WHAT DOES MIX LOOK LIKE? SO WHY DID YOU MAKE ME MAKE THAT SHORTCUT? I dunno, misplaced sense of power? No, really, say you wanted to just launch a server without actually playing the game. Why would you do that, you ask? Well, maybe you just like to see your name in lights, or maybe you have a bit of excess bandwidth to share. In any case, people will be happy to see you do this. The shortcut makes it easy for you to do this, since you can just double-click the shortcut to start up a new copy (using the same options it had the last time you ran it). But I mentioned we have to add some stuff to the shortcut first, or else it won't be a public MIX server, and you need it to be public if you want other people to see it. Find c:\WoS\mix\mix.exe (you may have installed to something other than "c:\wos"
Make a note to yourself: "This is what he's talking about when he says SHORTCUT"
And remember, I am saying "c:\wos" at the front because that's the DEFAULT installation location. You need to use what's right for you. Also notice that the slash characters change direction between the first half and the second half. This is the most painful part of the exercise, since you probably won't be able to see the whole line at once, and any typing errors at all will make it not work right. If you have a super-computer and a ton of bandwidth, then go ahead and run multiple servers at the same time, but: Make a separate shortcut for each one, and give each one a unique name. If you need to be able to maintain separate settings/banish lists for each server, then make a new folder for each server, copy MIX.EXE to that folder, and make each shortcut point to exactly one copy of MIX. If you have nothing better to do, you can add a copy of your shortcut to your STARTUP folder and then you will run your server automatically each time you boot your PC. WHAT ABOUT THOSE SERVER RULES? Oh right, that's what you wanted to read about first, isn't it? It just makes more sense in context is all, that's why I made you wade through the stuff above first. Server Rules (older servers have this labelled 'static' by mistake!) This is where you type in your server rules. Use these rules in any combination, as you see fit. They apply to your server only. noBleep (no value required. This rule prevents people from sending sentences containing certain profanities (no, you can't alter the list). If they *do* type such a sentence, they get a temporary gag which blocks *all* their chat until they restart the game. If they attempt to defeat this by creatively spelling profanities so as not to get caught by the noBleep rule, then they will (eventually) set off the global snert detector which will gag them for a day, a month, or forever, as it sees fit.) These gags, once earned, affect chat on ALL servers, even your own. May the rules be with you! Here are some extra tricks to be used only if you know what you're doing. 1.) My Computer has more than one IP Address. How can I tell MIX which one to use? Well, you can't. But you CAN tell MIX which ones to NOT use, which is hopefully just as good. How you go about determining that an IP address is incorrect is your problem, mister expert. This trick won't rescue you if the problem is that your computer simply doesn't HAVE a real IP address (for example, you are sharing a network connection with another computer). Where instead of 1.2.3.4 you put the bad IP address you want MIX to not think it is listening at. You can have as many IP addresses on this list as you like (but does your computer really have that many NICs? I didn't think so.) Most people have this problem because they have one IP address when using the company's LAN access to the internet, and another when they directly dial their modem into an ISP. Left to its own devices, MIX will assume the 'more recently established' network connection is the one to use. The "=1" bit is what turns off the address. If you said "=0" then you would be spitting in the face of sanity. MIX is the property of Synthetic Reality and all rights are reserved. If we can figure out a way to convince people to pay for this, you can be sure we'll give it a try. But for now it is expressly intended to simplify the lives of our customers in their pursuit of happiness using our games.